When the 25 April 2015 earthquake struck Nepal, photo.circle was in the midst of planning for Photo Kathmandu, Nepal’s first photography festival. The disaster put all festival plans on hold, diverting much-needed attention towards humanitarian work. The team from photo.circle was involved in a number of relief operatons in and around the Kathmandu Valley in the aftermath of the earthquakes. Once the immediate humanitarian crisis was over and the state and various I/NGOs had taken over, photo.circle went back to doing what it does best — organizing meaningful photography events on short notice. Despite focussing our energies into planning and logistics for the festival, we were still dogged with a sense of responsibility to give back to the community where Photo Kathmandu was going to be anchored — the city of Patan, which had suffered much in the earthquake. We decided that we would attempt to rebuild a destroyed cultural site with significant local value that might not be on the radar of big donors. This site was to be the Lam Pati in Chyasal, a vibrant cultural site that tied the community together. Before it’s total destruction in the earthquake, elders gathered at the Lam Pati to discuss community issues, religious leaders read the stars to set important dates, important decisions were made and frequent bhajan (religious music) programs were held. We set up a fundraiser to benefit the rebuilding of the Lam Pati — a Limited Edition Print Sale of images from the Nepal Picture Library and from the Peace Corps Nepal Photo History Project. The images on sale were later supplemented with more contemporary work by photo.circle’s friends. By the end of October 2015, just days before the opening of Photo Kathmandu 2015, we had already raised 12,000 USD. Over 70 people from all over the world had contributed to the fundraiser by buying one or more limited edition prints. During the official opening ceremony at the Patan Museum, the Photo Kathmandu team proudly handed over a cheque of that exact amount to the president of the Kwelachhi Tol Sudhar Samiti, which would be leading the rebuilding effort. On 25 February 2016, community representatives met with photo.circle to discuss the rebuilding effort. In early March, the Kwelachhi Tol Sudhar Samiti and photo.circle representatives met with Thomas Schrom, a civil engineer and co-director of the Kathmandu Valley Preservation Trust, to discuss the designs that a community architect had drawn up. Mr. Schrom provided valuable advice on earthquake proofing the new building and showed the team interesting designs from other patis in the area. The next step for the community architect will be to come up wth detailed designs of the new pati, based on which the final budget will be calculated. Meanwhile, photo.circle and the Kwelachhi Tol Sudhar Samiti have opened up a joint account at a local community cooperative and deposited the first 7,000 USD (7,00,000 NPR). Suresh Shrestha has been appointed project coordinator. Mr Shrestha comes from a contracting and architectural background, along with experience in traditional building techniques. His role is to coordinate with community members who are providing labor and ensure that quality standards are met. 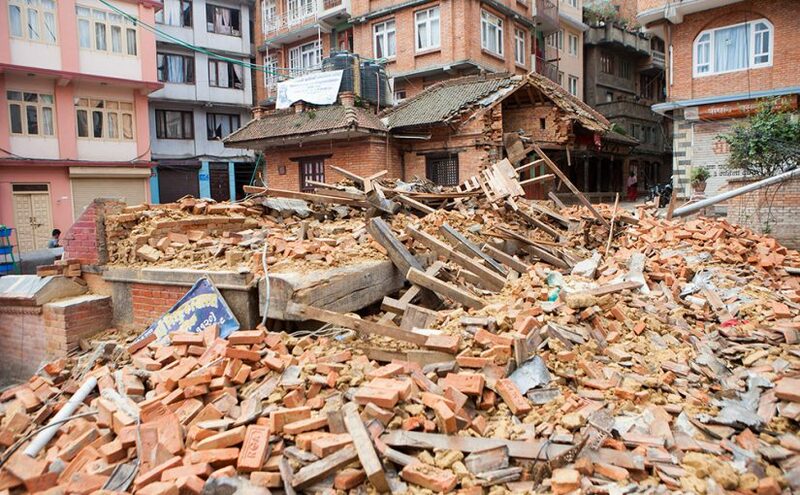 The first step that Mr Shrestha undertook was to go through the debris stacked in neighboring buildings and decide what parts of the old pati are salvageable and what has to be made anew. He has decided that six carved wooden pillars from the old pati can be reused and will serve as examples for carpenters who will be crafting new pillars during the monsoon season. We expect the current temporary structure to be dismantled by mid-September, after the Indra Jatra festival. Then, the actual rebuilding will begin.